We hear about echo chambers and how bad they are, how they are petri dishes of confirmation bias. We hear that we should listen to the other side, and that's it's unfriendly to unfriend. But what do we do with the people who are mean to us online? Are we required to just sit there and take it like a man? To this I say a hearty NO. You are not required to subject yourself to emotional abuse. Your friends are not required to endure emotional abuse in spaces you're responsible for. Unfollow, unfriend, block. Put them on a special list so they can only see the pictures of your puppy. That's what those magic buttons are for. "But won't that create an echo chamber?" folks worry. "Are you getting your news from reputable sources?" I ask in return. And if the answer is yes, then don't worry about an echo chamber. If you're getting your news from good, solid reputable sources, then you're not creating an echo chamber when you curate your social media space with care. You're not trying to avoid reality or skew the information you receive, just to keep yourself comfortable. You're simply having good boundaries and creating a space for yourself and your friends to breathe easy every now and again. People who say otherwise might just be trying to cross your boundaries, but we know how to let folks like that do their own emotional work. They have their own pages that they can curate to their satisfaction. Our space is ours. We get to decide. So I'd been thinking about writing this post for a while. And, unusually for me, I even had the echo-chamber-title worked out. 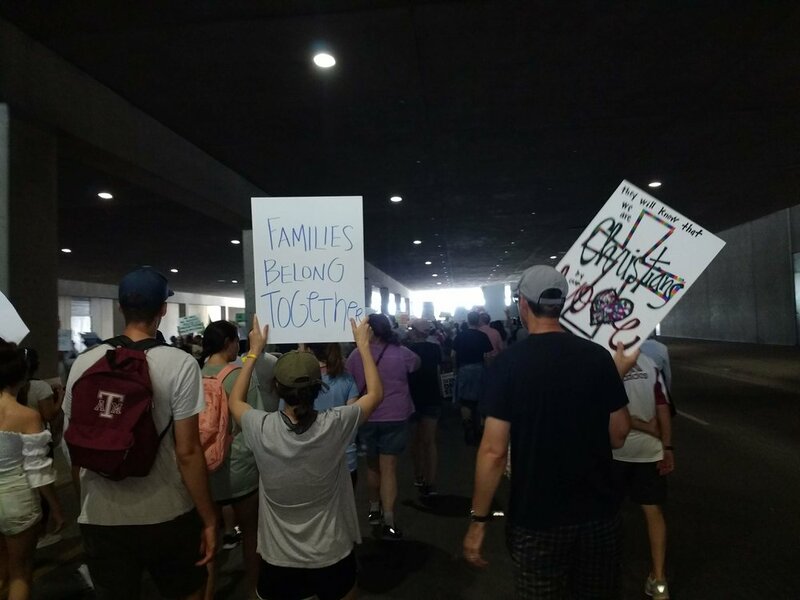 Then we went to the Familes Belong Together march in Dallas. It was 100 degrees by the time we stepped off in the march (thank goodness for a bit of a breeze) and the march organizers had very wisely not sent us on a very long march. We just walked down the hill from City Hall, took a left by the cattle drive sculpture at Pioneer Park, walked up to this underpass, then turned around and went back. "Love, not hate: that's what makes America great!" Seriously: best echo chamber ever. I might have shed a tear or two, in fact. We all walked out of that space remembering that we are in this together, that we won't give up, that we will continue to speak the truth to one another, that Love will win in the end. And that's the potential, incredible value of all our echo chambers. When we aren't using them to isolate or deceive ourselves, they can be places of enormous encouragement, hope, and incredible spiritual energy, as we see that we are not alone. We are not alone in our sorrow, and we are not alone in our passion for Love and justice in the world. That's what our echo chambers can do for us. They can be the best kind of church, the kind where you meet up with your peeps, hug each other, repeat some liturgy to remind yourself what in the heck we're here for anyway, hear some inspirational words, and go out stronger and wiser and better, ready to face the world again. So here's to another week in our echo chambers, y'all. Kindness to immigrants and strangers. And speaking of boundaries, my friend Cindy Wang Brandt invited me onto her brand-new podcast to talk about boundaries. We got into why boundaries are so difficult to acquire in authoritarian systems, and other such interesting ideas. Here it is, hot off the press today: Parenting Forward!